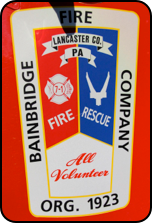 Organized in 1923, Bainbridge Fire Company provides Fire & Rescue protection to Conoy Township and parts of West Donegal Township as well as 4.5 miles of the Susquehanna River. Operating from one station, 20 volunteers answer an average of 250-300 alarms annually. Seating six (5 with SCBA), it is outfitted with a 10 kw generator, 6,000 watt light tower, dual reels supporting a full Amkus extrication tool system (4 rams, spreader & cutter), a 12,000 lb. rear winch and a cascade system complete with a 200’ air reel. Equipped for fire & rescue operations, it features 500’ of 5” LDH & 300’ of 3” supply line, two 200’ 1-3/4” pre-connects, one 100’ 1-3/4” trash line, two 10’ hard suction sleeves, 58’ of ground ladders (including a 36’ extension ladder) as well as a portable power unit with Amkus combi-tool, battery & air powered tools, cribbing, rescue struts, high lift jacks, a 4 gas meter, RIT pack and an A-frame tri-pod. 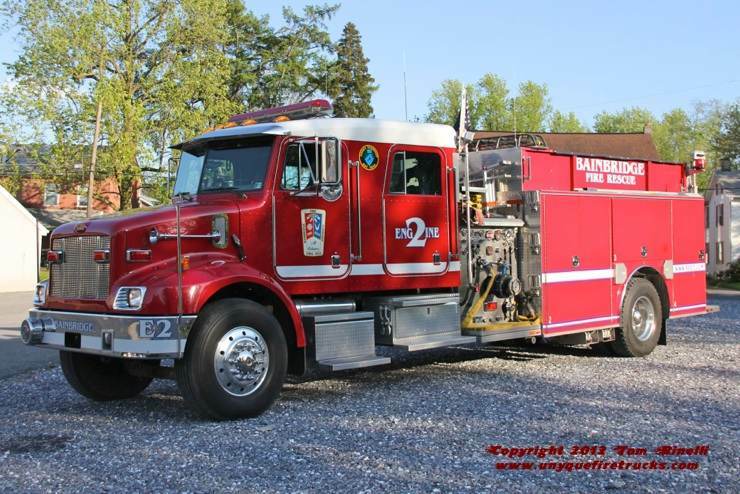 Bainbridge originally considered a Mack MC cab for this rig, however, due to cost, the Peterbilt cab was chosen instead creating this “unyque” looking apparatus. Tanker 7-1 - 2001 Peterbilt/New Lexington 1750 gpm/3000 gal. 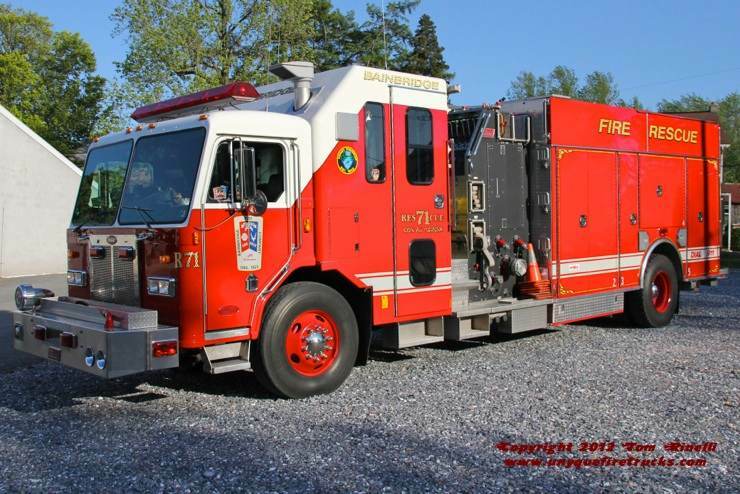 Featuring side & rear dump chutes as well as a 6 kw generator, it is equipped with a 4,000 gallon folding tank, 350 gpm portable pump, two SCBA’s, 38’ of ground ladders and two 15’ hard suctions. 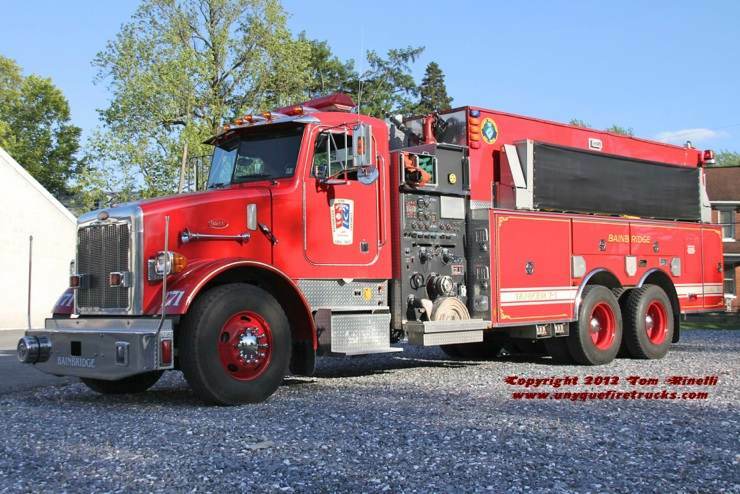 Engine 712 - 2003 Peterbilt/SEMO 1250 gpm/1000 gal. Featuring a 6kw generator, this rig is equipped with 4 SCBA, a 4 gas meter, thermal imager, RIT pack, Stokes basket, LZ kit, cribbing, 46’ of ground ladders, a high rise pack & two 10’ hard suction sleeves. Special thanks to Chief Joseph Mohr for arranging this visit & Deputy Chief Dave Stoner for his assistance in positioning the apparatus for photos. 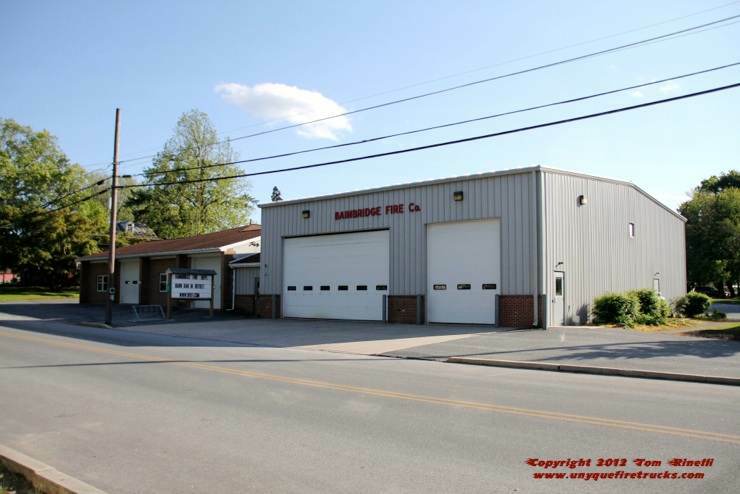 Bainbridge operates their entire fleet from one station which consists of the original firehouse as well as a newer 3 bay addition that houses the apparatus shown below.